A native of Western New York, Coach Sal, as he is affectionately called by his legion of players, is one of the most decorated college basketball coaches this region has ever produced. He began his 39 years on the bench at Hilbert College, where he posted a mark of 253-62 from 1977-1990. The Hawks posted an incredible 96 straight league wins under Sal’s tutelage, winning eight league titles and making eight straight national tournament appearances, including a top eight finish. He is a member of the Hilbert College Hall of Fame and is the all-time winningest coach at the school. He parlayed his success at the Hamburg-based school to a position as the head coach at the University at Buffalo. In eight seasons his squads had five 20+ winning campaigns en route to a mark of 155-71. Three East Coast Conference regular season titles and one Mid-Continent Conference championship were part of those campaigns. More importantly, he ushered the Bulls into the Division I era winning 23 games in their first year of Division I competition. His 21-year tenure at Hilbert and U/Buffalo resulted in the most collegiate women’s basketball wins by any coach in Western New York history. Seeking his next challenge, Buscaglia moved downstate where he took over the reins of the Manhattan College program. He took the Jaspers to the NCAA Division I tournament in 2003, while winning the MAAC regular season title for the first time in school history. During his five years, he compiled a 79-65 record and recruited 10 players that would earn Metro Atlantic Athletic Conference honors. He was twice named MAAC Coach of the Year, and in 2003 was the all-MET Division I Coach of the Year. His next head position came at Robert Morris. He, and his son Charlie, initially a four year volunteer coach, then associate head coach, and now head coach, inherited a program that had experienced 14 consecutive losing seasons. That streak came to an end finishing with 20 wins in his second season, the third best turnaround in NCAA Division I history, at the time. 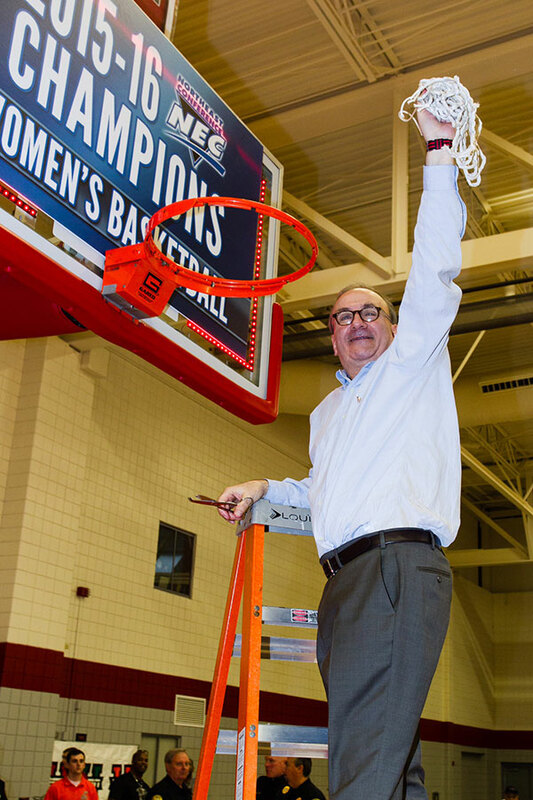 During those 13 seasons, he led Robert Morris to six post-season national tournaments, including four NCAA Division I championship appearances. Sixteen of his players received all-conference kudos and five were named Player of the Year. At 225-178, he is the Colonials’ all-time winningest coach. Overall Coach Sal’s career mark ended with 712 wins against only 369 defeats, including 443 wins at the Division I level. He earned 16 Coach of the Year honors, made 15 national tournament appearances and captured 18 conference titles. Aside from the wins, tournament appearances and coaching honors, Coach Sal is applauded for his advocacy of women’s athletics and is fondly remembered by his former athletes as one of high character and integrity who put the welfare of his players above personal motives. Coach Sal has an undergraduate and graduate degree from Canisius College in addition to a graduate degree from Buffalo State. Coach Sal, recently engaged to Linda Glose, has 2 children, Deanna (Mark) and Charlie (Roseline) and three grandchildren, Paityn, Shane and Eva.